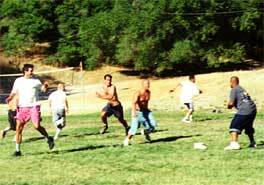 From August 23 through the 27th, 1999, 50 at risk teens and more than 30 volunteer counselors took part in the Us Foundation summer camp at Camp Whittier. 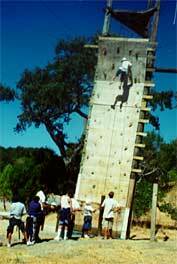 Camp Whittier is a rustic 55 acre camp property located 17 miles north of Santa Barbara nestled among the hills of Los Padres National Forest, near Lake Cachuma. 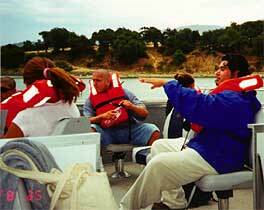 ZACA LAKE CAMP, 1998: Here are stories and pictures from the first Us Foundation Camp at Zaca Lake. 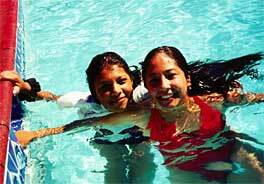 On the first day of camp, teens, aged 13-17 years old, arrived in the morning from Santa Barbara, Goleta, Isla Vista, and Lompoc and other surrounding areas. Their bags were transported to the boys' and girls' cabins and then orientation tours were conducted for all the campers. For each of the next four days, campers enjoyed a hearty breakfast followed by their choice of several three-hour personal transformation and motivation workshops. After a healthy lunch, the teens chose from a rich assortment of afternoon activities including swimming, hiking, ropes course, basketball, football, archery, jewelry making, art, massage, collage making, photography, video documentary, and other fun and creative programs. In the evenings, the teens watched the daily news created by our instant television station, WHIT, that was filmed and narrated by a crew of their fellow campers during the day. Most evenings ended with stories by the camp-fire. On the Thursday afternoon campers hiked to Lake Cachuma for a nature cruise, watershed education, and practical testing experience lead by the 4H Aqua Pura counselors. That evening, a whale and dolphin expert shared stories and videos about the life and inter-relationship between sea life and the human world. On another evening, the campers heard a Native American share experiences about the history of the land on which Camp Whittier stands. On the last evening, the camp community enjoyed a play which was written, produced and performed by the teens themselves from material developed in their morning workshops, The play was followed by a dance party with a live DJ. While the teens had a great time, some revealing comments about the camp came from the counselors and included quotes like, "The week was more powerfully transformative than any workshop or retreat I've ever been to; and I've been to many all over the world, including India!" "The week brought up my shadows to deal with more effectively than I have ever experienced." "I can't wait to come back, I had so much fun!" A debriefing party for the counselors was held to share camp stories, learn from our experience, to explore new possibilities to make next year's experience even better, and to celebrate and enjoy each other's company. Many new and old friendships were made and renewed and it was fun to share and play together. Please return to our website to stay updated on camper and counselor updates and watch for the announcement of the place and dates for next year's camp. 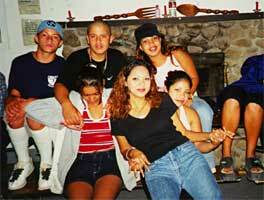 A special thank you to all the teens who attended Camp Whittier 1999 for having the courage to open your hearts and minds to the information we shared. We really hope it made a difference for you and that you will carry many good memories with you always. And a big thank you to the all the counselors and volunteers who gave generously of their time, energy and love to create a very special week for teens who don't normally have this kind of opportunity.